born in France in 1954, is a tubist, conductor and composer. He studied the tuba at the Conservatoire de Strasbourg with Joseph Vaillant, at the Conservatoire National Supérieur de Paris, and musicology at the Strasbourg University. In addition he studied composition with Claude Ballif and Franco Donatoni. As an instrumentalist he has participated in numerous premiers, and has appeared regularly as a soloist at all leading festivals for contemporary music. He frequently played with the Orchestre Philharmonique de Strasbourg, the Orchestre de Paris, the Orchestre National de France, and the Orchestre Philharminique de Radio France, as well as various jazz groups. From 1976 to 2001 he was the tuba player of the ‘Ensemble InterContemporain’. During this time he also worked on several research projects at the Ircam Centre. He is the author of a book on the ‘contemporary tuba’ (funded by the french cultural ministry). Recently he performed Helmut Lachenmann’s tuba concerto with the Symphony Orchestra of the Hessiche Rundfunk in Fankfurt in 2010. His teaching is inspired by coordination and breathing techniques developd by Jacques Dropsy. Gérard Buquet taught chamber music at the CNSM in Paris from 1997 to 1999, and then obtained the position as tuba professor there in 1999. In the same year the television channel ‘Mezzo’ devoted a portrait film to his work. Since 2000 he holds a professorship as director of the ‘Ensemble für Neue Musik’ at the Musikhochschule in Karlsruhe, Germany, as successor of Peter Eötvös. Gérard Buquet created a music production company in 1988 and a publishing company which he directed in 1993. This enabled him to promote contemporary music by integrating it in large public events, such as The ‚Opéra Goude’ (1989 at the bicentenary of the French Revolution), and for the concert at the Trocadéro in Paris, in honour of Nelson Mandela’s visit. Gérard Buquet also organised numerous concerts for the Wind and Percussion Ensemble of the Ensemble InterContemporain which he managed. 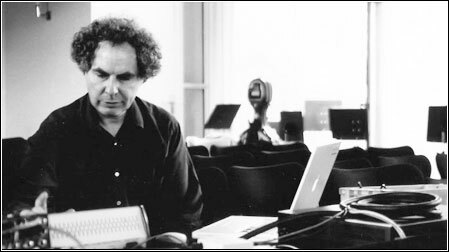 In 2007 he conducted ‘les Etudes d’après Séraphin’ by Wolfgang Rihm, for the 10th anniversary of the ZKM, with the Ensemble für Neue Musik of the Musikhochschule Karlsruhe, and the Ballet ‘Badisches Staatstheater’. In 2008 he conducted a concert devoted to the harp repertoire at the ZKM (Ensemble für Neue Musik, Karlsruhe, soloist: Frédérique Cambreling). The same year he conducted a concert “Messiaen and his students” at the Olivier Messiaen Festival in Karlsruhe. On the 16. and 18. of March 2012, Gérard Buquet will be conducting six world premieres in Karlsruhe, celebrating Wolfgang Rihm’s 60th Birthday (Coproduction HFG and SWR). Lately Gérard Buquet is devoting increasing time to composing – 2002, ‚AdVerb’ for solo cello and electronics, premiered at Radio France, Paris, and recently recorded by the cellist Eva Böcker (Ensemble Modern) for her CD ‚Spoken Tones’ (Coproduction Ensemble Modern Medien and Hessischer Rundfunk). 2005, ‚Les danses du temps’, written for the musicians of the Ensemble InterContemporain, and premiered at the Ircam cantre in Paris. This work has been performed by Ensemble Modern at the Alte Oper in Frankfurt, and the Klangforum of Vienna in 2011, at the Vienna Konzerthaus and the Cologne Philharmonie. 2009 ‚L’astre échevelé’ (commisioned by IRCAM) for soprano saxophone and electronics, premiered by Marcus Weiß at the Ircam Centre in Paris. In 2010 the slovenian woodwind quintet ”Slowind” and the bass clarinetist Dominque Clement (Ensemble Aleph) premiered his piece ‘l’enclume des forces’ as part of the European music project ”LAB” in Ljubljana, Paris, Cluny and Riga. He recently completed his composition ‘die Malerin von Bellevue’ for 6 female singers and 6 instruments, which will be premiered in Heidelberg on February 25th, 2012, and subsequently recorded by the WDR, with the Schola Cantorum and the Ensemble Aesthesis of Heidelberg, directed by Walter Nussbaum, as part of their ‚Prinzhorn’ project. Gérard Buquet is currently working on a composition of a double concerto for 2 harps and orchestra for the Stuttgart Radio Symphony Orchestra and Frédérique Cambreling and Renie Jamahata as soloists. The premiere will take place on 21st November 2013 in Stuttgart.